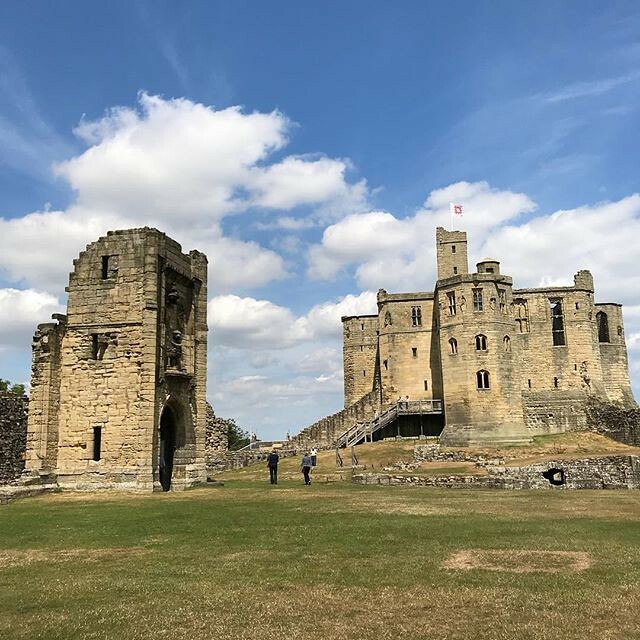 Warkworth Castle and Hermitage | The Tales of Missus P.
I was going to write an update for June because the last post I made was when we visited the Picks in Liverpool in March. However, life being as it is, and my trying to spend more time with my brain turned to de-stress, so I haven’t spent loads of time updating here. I started plenty of posts, but never got around to finishing them. But, alas, it’s Sunday, and Steve is getting lunch ready, and Daisy is hanging out with me in the computer room, listening to 6 Music, so it’s as good of a time as any. Anyway, so for this post, I figured I’d work backwards a bit about what’s been going on. Yesterday we went to Warkworth Castle (seen above) and Hermitage. It was a glorious day and we took Daisy along who has now been on her first boat ride. (She was more interested in the ducks in the river than the actual boat.) The castle was really well-preserved and it was very cool to be able to take the stairs to the wine cellar and walk upstairs to see the awesome view of the coast at Amble. Unfortunately with the heat, we didn’t travel to the beach on the way home, but we did have a picnic on the castle grounds, and after the boat trip and a relaxing sit down by the River Coquet, we went for some ice cream at Morwick Dairy. There Daisy met some cows of all age ranges, which she wasn’t so sure about. Of course I fell in love with all of the calves and decided that I do want a farm when I retire. A nice renovated farm house in Northumberland. Turn it into a B&B but still keep my chickens and occasional farm animals. Ahh. Bliss. Anyway, if you’re heading to the dairy after the castle visit, make sure to check your Google Map because we entered in the post code that was given and ended up down the street at someone else’s farm. Oh well, we made it eventually. Last week I started my bullet journal which I’ve been going on about via Twitter. I am so not artistic in any way, so trying to make graph paper with notes pretty is just not something that naturally comes to me. I started watching videos on how to set up a bullet journal, and this channel from Seventeen has been great. I have highlighters, stickers, fine line pens, and a ruler now with all the Rulers of England that I bought at the castle gift shop. I may be a British citizen, but as an American, I feel it is my duty to appreciate my love of the English Heritage by purchasing souvenirs. Whenever I go somewhere I buy a magnet for our fridge at home, and the magnetic shelf in the office where we keep all of our ones from holidays. Since my “holidays” are weekend getaways and little adventures, I like spreading the British pride to my co-workers. Aside from the bullet journal, I wrote one day for Camp NaNoWriMo, which is shameful because I always have the best intentions. Maybe the journal will keep me more on target. I’m also going to use the journal for my blogging and today I can mark down that I actually wrote a post. Hooray for me! As of today we have 63 days, 23 hours, and 39 minutes left until my Florida trip. This year we’re going on a cruise again but this time we’re going to Nassau instead of Freeport, so I’m glad we’re seeing something different. Also, my parents are coming with me, which I’m also super happy about. They aren’t convinced that they’ll like it, but since it’s a three day excursion, I think they can dip their toe into cruising with us and see how much fun it can really be. We’ve been watching videos on YouTube about Toy Story Land, and ogling new merchandise to buy in the parks. Apparently there’s a new Disney Play app that I’ll be getting once I’m home. Plus, they have new MagicBands and I think I want the Mickey ice cream one, but I can’t find it online again, so I may have to go with All About the Bow Minnie. Our flat sale is going well as far as we can tell. We finally got our sold sign out front, and the mortgage offer from the bank has gone to the solicitor, so hopefully we’ll be in our new place before we go on holiday. I know I have way more travelling updates to post here because we’ve hit some great National Trust and English Heritage sites, including our trip to Whitby at the beginning of June for Steve’s birthday. However, it is now lunchtime and my fish and chips await me! This entry was posted in All About Me, Travel, Writing and tagged bullet journal, Camp NaNoWriMo, Disney World, house, North East, Northumberland. Bookmark the permalink.